theScore's Gianluca Nesci spent five days in Catalonia ahead of the Clasico between Barcelona and Real Madrid. You can find the complete collection of stories from the trip here. BARCELONA - What does it actually mean to be "more than a club?" The famed Barcelona slogan - "Mes que un club" - can be grating on supporters of intracity rival Espanyol. Unlike at the Camp Nou, just a short drive away, you won't find the phrase lining the seats of the RCDE Stadium that Espanyol call home. It feels like it would fit right in, though. "When I see someone wearing the club's colors in the street, they are my family," Albert Saus, Espanyol's academies director, explained. "It's something special." That familial feeling seems to be a staple of life at Barcelona's "other" outfit. As the Blaugrana continue to grow globally, their brand seemingly reaching every nook and cranny of the football world, Espanyol continue to work at a grassroots level, building on their already fervent group of local supporters. Still more than a club, just in a different way. For some, like Tottenham boss Mauricio Pochettino - a former player and manager at Espanyol - that unbreakable link means never crossing the line and managing Barcelona. Coaching there would be "impossible," he said last month, thanks to his love of the Periquitos. As you find out when visiting the club's tightly packed, 40,500-seat stadium, he's not alone. That attachment can run quite a ways deeper still. There's loving your club, and then there's loving your club forever. A tour of the stadium begins, metaphorically, at least, at the end, in a columbarium that houses the remains of thousands of supporters. The memorial space, which features 5,000 niches built into the walls, is capable of holding the ashes of 20,000 fans. Each burial area can accommodate up to four urns, according to Yolanda Rodriguez, who manages Espanyol's "Espai Memorial." At €5,000, supporters have the option of purchasing the entire niche for their family, while €3,000 will get you an individual slot in the gleaming mausoleum. A small plaque denotes the family, or individual, inside each small resting place. A communal burial area (pictured above) is also available at a cost of €1,000, with ashes stored inside a velvet bag and placed underneath the enclosed replica of the club's stadium. Family members of those in repose can visit to leave flowers and other mementos at their leisure; the memorial room is only open to the public on select days of the year, though it is always open two hours prior to kickoff on matchdays. Late Espanyol captain Dani Jarque is also honored inside the serene space. Jarque, who joined the club's academy when he was 12 years old, died of heart failure in 2009, while he and his teammates were in Italy on a preseason tour. He was 26. The homegrown central defender, instrumental in helping his side claim the Copa del Rey title in 2006, had just taken over from iconic scoring leader Raul Tamudo as Espanyol's permanent captain prior to his death. An armband, emblazoned with his number 21, is featured prominently in a section of the columbarium that pays tribute to his memory. The stadium is also home to one of the most emotive items in Spanish football history. Andres Iniesta's goal to win the 2010 World Cup sent the country into rapture, but it was his subsequent celebration that brought many associated with Espanyol to tears. 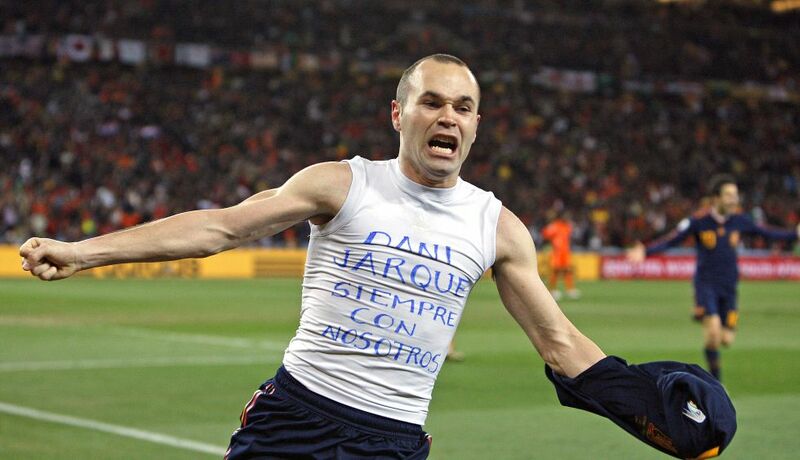 After arrowing the ball home in extra time, the Barcelona legend ripped off his jersey as he ran toward the corner flag, revealing a message written in blue marker across his undershirt: "Dani Jarque, siempre con nosotros," it read. "Dani Jarque, always with us." The two had been close friends. From then on, Espanyol supporters, putting aside the intensity of the rivalry with their intracity peers, gave Iniesta a standing ovation whenever Barcelona visited the RCDE Stadium. "I felt it on the pitch, this is biggest thing, people have sent me messages ... people are more important than rivalries," Iniesta said in 2010, after receiving the warm welcome for the first time. Some things can transcend football, as it turns out. Everlasting bonds are something of a theme at Espanyol, in life as much as in death. The club's 9-year-old stadium also hosts weddings, with ceremonies taking place on the pitch - if you so choose - and the reception moving upstairs into the multi-purpose presidential room, which is also used for conferences, gala dinners, and various corporate events. As Judit Ibanez, a member of Espanyol's marketing team, explained, there's only one piece of advice she would share for football-loving couples planning on tying the knot. "Make sure your wedding day doesn't coincide with an important match," she said through a translator. To date, there have been two weddings hosted at the RCDE Stadium. The most recent was that of former club president Daniel Sanchez Llibre, which, aside from some rain and a soaking wet train on the bride's dress, went off without a hitch, Ibanez said. The other was a more memorable affair. That "important match" she was referring to? A Champions League final between two of Spain's most storied clubs certainly fits the bill. Espanyol's maiden wedding, held on May 24, 2014, ran alongside the first-ever meeting in a European Cup final between bitter city rivals Real Madrid and Atletico. Dinner was served as the contest in Lisbon kicked off. A television was set up in a room adjacent to the main hall so guests could watch the match. The poor caterer never had a chance. The food was always going to be overshadowed. Half the crowd, including the groom, huddled around a TV in one room, while half enjoyed their meal in the other. "It was like some kind of a parallel wedding," Ibanez explained. That the game itself turned out to be one of the most dramatic finals in recent memory only complicated matters. Sergio Ramos' 93rd-minute equalizer, paving the way for Los Blancos to dominate in extra time and capture their historic 10th title - La Decima - has gone down in tournament lore. "When it was time to dance, the only person I saw sitting at the head table, all alone, was the poor bride, just playing with her phone," Ibanez recalled. "We had to go and drag the groom out of the other room so they could start dancing." Things worked out just fine, though. The couple is still married today, Ibanez said, adding that they have two children. The Espanyol family continues to grow.